In the design for a fire or smoke emergency, a main concern is maintaining an evacuation path that is free of smoke and hot gases. In ventilated tunnel fires, smoke and hot gases may form a layer near the ceiling and flow in the direction opposite to the ventilation stream. 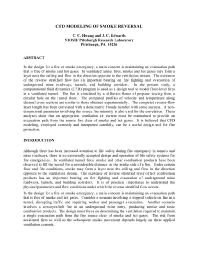 The existence of the reverse stratified flow has an important bearing on firefighting and evacuation of underground mine roadways, tunnels, and building corridors. In the present study, a computational fluid dynamics (CFD) program is used as a design tool to model floor-level fires in a ventilated tunnel. The fire is simulated by a diffusion flame of propane issuing from a circular hole on the tunnel floor. The computed profiles of velocity and temperature along channel cross sections are similar to those obtained experimentally. The computed reverse-flow layer length has been correlated with a densimatric Froude number with some success. A nondimensional parameter involving the source fire intensity is also used for the correlation. These analyses show that an appropriate ventilation air current must be maintained to provide an evacuation path from the source fire clear of smoke and hot gases. It is believed that CFD modeling, employed correctly and interpreted carefully, can be a useful design tool for fire protection.